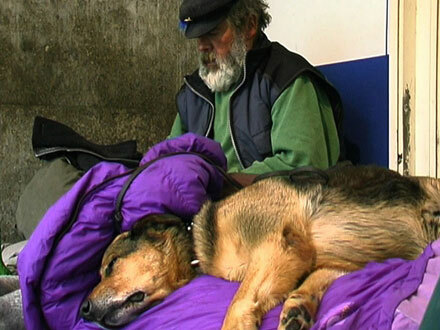 "sleeping rough" was shot during the summer of 2001 among a group of homeless men and women in the city-centre of Hamburg after six months of ethnographic fieldwork. While the homeless are often represented as outcasts of society, this film shows critical and self-reflective people who master their public lives with an undefeated spirit. The cohesion of the group provides the matrix through which individuals in varying stages of liminality can find solace and support. The camera offers a privileged view of daily routines and work as well as leisure time which is spent socialising in a public square equipped with a container for luggage. Intimately and sometimes with disenchanted frankness the protagonists reflect on the circumstances of their situation, between romance and tragedy, past disappointments and future ambitions.